Custom Coloured Poster Snap Frames are available to order. 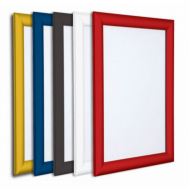 Select your Bespoke Colour Snap Frames from a range of 213 RAL colours. The snap frame extrusions are powder coated in our on site facility, then constructed in our workshop. Our snap frames are manufactured with UV grade anti glare PVC covers, and a 1.5mm rigid PVC back panel. They clip open for fast poster replacement. Most of our models of snap frames can be coloured to order. We can manufacture bespoke coloured frames with either 25mm or 32mm frame profiles. For a quotation for your bespoke frames, please call or email our office. Bespoke Snap Frame Light Boxes, Custom Made to Order, available to order, manufactured in aluminium,..